Native of Pittsburgh, PA. Graduated from Penn. State University with B.S. in Civil / Structural Engineering. Worked in Washington D.C. from 1979 to 1988. 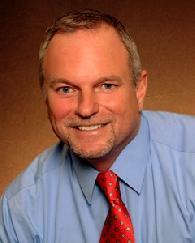 Have lived and worked in West Palm Beach since 1988. 1992 obtained my Florida Real Estate Linense and joined the Keyes Company. I believe in providing personal service with honesty and integrity! Historic Communities, Waterfront properties, Residential; single family homes, condos, townhomes, and lofts, and pre-construction. Condition: “Some homes take more work than others,” an article at Realty Times notes. For example, an older home may need replacements for appliances and systems from wear and tear over time. Foreclosed homes may have damage from sitting vacant for so long. Home buyers can have a home inspection done to make sure they’re not taking on more than they can handle. Lifestyle: Does your buyer love having everything within walking distance or is open space what they prefer? Is your buyer is a private person who would prefer a single-family home in the country or a buyer who prefers to share walls and common areas with neighbors, such as with condo living? Upkeep: How much maintenance will be involved with the home? For example, if your buyers prefer low-maintenance living, they may find condo living more suitable since they won’t have to tend to the yard. Home buyers may also want to factor in the school system, the area’s taxes, and even future resale value in narrowing their choices, housing experts suggest. Pending sales of existing U.S. homes surged in October by the most in nearly a year as Americans took advantage of low interest rates for mortgages, data from a real estate trade group showed on Wednesday. The National Association of Realtors Pending Home Sales Index, based on contracts signed in October, rose 10.4 percent to 93.3 from 84.5 in September. That was the biggest monthly gain since November 2010. 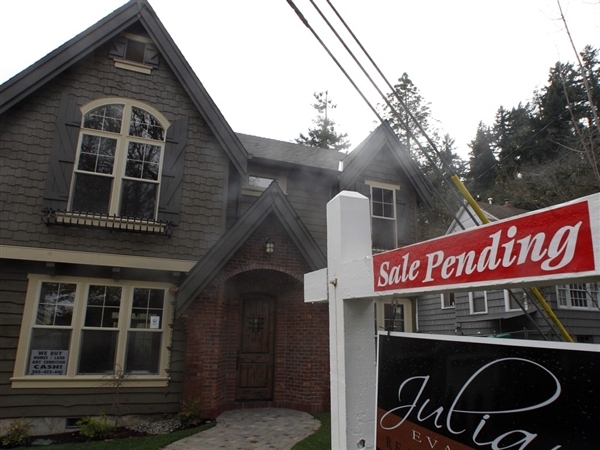 Economists polled by Reuters had expected pending home sales to climb 1.5 percent. “We hope this indicates more buyers are taking advantage of the excellent affordability conditions,” said NAR economist Lawrence Yun. The Fed said in September it would renew its effort to help the housing market by reinvesting some of the maturing debt it holds into mortgage-backed securities. That has helped bring 30-year mortgage rates to record lows. 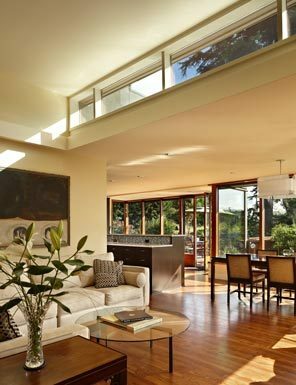 “When we walked in I said, ‘It’s my house; that’s it!” says Robin Shapiro, talking about her Mount Baker Midcentury made newly modern. “I knew I was sunk,” says her husband, Mike Riley. “I knew it was a done deal. And by lucky he doesn’t mean Lucky, the family Goldendoodle. He means fortunate in that one day in 2010 they happened upon their dream house. It was just sitting there. Two miles away from their house in Madrona. A groovy piece of 1969 residential architecture designed by Milton Stricker (the first apprentice of Frank Lloyd Wright to be licensed in Washington) and already updated with care by Dyna Contracting. “We did everything to that house,” Riley says. And over the course of two remodels, as karma would have it, they had used Dyna Contracting to do it. “I guess I always had this dream that I would always live in this calm, Zen home,” Shapiro says, pausing so we can hear the silence. Outside the glass walls of the dining room a leafy green canopy cloaks their neighborhood. What Dyna had done was to nudge the 4,000-square-foot classic Northwest-infused Midcentury modern into the next century by covering it in an ipe rain screen and, inside, opening the kitchen, expanding the master suite (with a private deck) across the top floor, updating the bathrooms, opening the staircase and transforming the downstairs into a hangout room/guest suite. Robin Freeman of Two Nine Design helped select new finishes. But if it wasn’t broke, Dyna didn’t fix it. The windows across the back of the home remain, as does the two-story, cream-block fireplace. It turned out, Dyna had been working on both houses at the same time. The Mount Baker house was completed in October 2008. Before moving in, Riley and Shapiro had Dyna put in a garage with a guest suite overhead, designed by Paul Whitney of Whitney Architecture. All of their furniture and art from the Madrona house fit perfectly. “We worked with Jennifer Randall on the interiors, and she told me, ‘It’s like your furniture was waiting for this house,’ ” Shapiro says. And all of the above is why Riley and Shapiro are inviting a whole lot of people over Dec. 3 as one of the homes featured in this year’s Mount Baker Home Tour. New York City foreclosure filings dropped 32% in the third quarter over last year. Lenders filed 3,168 foreclosures on single-family and multifamily properties during the quarter, according to a study from New York University Furman Center for Real Estate and Urban Policy. The notices, the first stage in the foreclosure process, also dropped 5.4% from the previous three months and were down more than 46% from the peak in 2009. Roughly 73% of all filings occurred in either Brooklyn or Queens. Over the last two quarters, notices have been more evenly split between homeowners and landlords. “Given persistent unemployment and delinquency rates nationally, it remains unclear whether the past four quarters of reductions in foreclosure notices is the result of the slow pace of foreclosure proceedings, or a promising sign that more homeowners are now able to meet their mortgage obligations,” said Vicki Been, faculty director of the Furman Center. Court rule changes and a massive backlog pushed the average completion time to beyond 900 days, the longest in the nation, according to RealtyTrac, which monitors filings across the country. The state’s administrative board of judges implemented an affirmation rule in October 2010. Banking attorneys now have to sign an affidavit vouching for the accuracy of the records in a foreclosure, forcing these lawyers to go back and check documentation before filing a case. While the rule allowed courts to begin working through the backlog, the city hit another snag in November when the default services law firm Steven J. Baum PC announced it would close. Baum, which did work for Fannie Mae and Freddie Mac, came under investigation for illegally signing foreclosure documents en masse in an effort to speed up the process. When firms in Florida were shuttered for similar violations, thousands of cases had to transfer to other firms already overbooked. Courts there spent months sorting through the cases to determine which ones needed to be restarted and which ones could proceed. Florida foreclosure timelines skyrocketed to the second longest in the country, just behind New York. Meanwhile, the 5,615 property sales in third quarter dropped 3.6% from last year. Home values declined in every borough but Manhattan. “Sales volume continued to lag in the third quarter of 2011, showing little change since last quarter and remaining well below the sales volumes we’ve seen in the city in the past decade,” said Ingrid Gould Ellen, faculty co-director of the Furman Center. In New York City, values are down more than 20% from the peak, which crested sporadically across all major boroughs just before the financial crisis struck in 2007. The number of homes listed for sale fell for the fifth straight month in October, hitting the lowest level in more than four years. The 2.12 million homes listed for sale in October was down by 3.5% from September and down by 21% from one year ago, according to data compiled by Realtor.com. 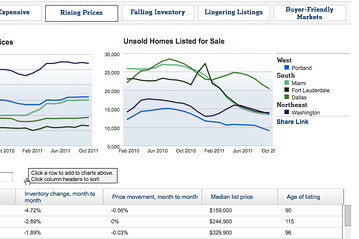 The Realtor.com figures include sale listings from more than 900 multiple-listing services across the country. They don’t include all homes for sale, including those that are “for sale by owner” and other properties that aren’t marketed through multiple-listing services. Inventories typically rise by around 0.8% in October from September, according to Zelman & Associates, a research firm. But they have been falling for several recent months amid a slowdown in foreclosures by banks and as home sellers, frustrated by low-ball offers, hold their properties from the market. Inventories declined in 29 of the 30 major metro areas during October, led by Portland, Ore. (-6.9%); Seattle (-5.3%); and Dallas (-5.2%). Inventories increased in Phoenix by 0.4%. Six markets saw a monthly uptick in median asking prices, led by Phoenix (5.1%), Dallas (1.2%), and San Francisco (0.6%). Prices were flat in another eight markets, while they fell in 16 metros including Cleveland (-2.3%), St. Louis and Philadelphia (-2.1%). For the year, the inventory of homes listed for sale is down most sharply in Miami (-49%), Phoenix (-48%), and Orlando (-45%). The National Association of Realtors also reported a decline in the number of homes on the market. At the end of October, total housing inventory fell 2.2% to 3.33 million homes, the lowest level of the year. Recognized as an established leader in the Central Georgia residential real estate market, Blair Myers is an accomplished and results-driven professional. An aggressive representative for both buyers and sellers, many of Blair’s clients have enjoyed buying properties with “built-in equity,” and selling for “top-dollar” with an average of less than sixty days on the market! It’s no wonder that more and more people are turning to Blair Myers. As an Accredited Buyer’s Representative (ABR) and Seniors Real Estate Specialist (SRES), both recognized by the National Association of Realtors, Blair has been specially trained and certified to work with buyers in their relocation to the Central Georgia area and to assist active adults with all their real estate needs. 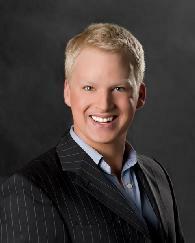 With an educational background in the social sciences, marketing and real estate, along with corporate experience in marketing, sales and public relations, Blair Myers brings together the tools and skills necessary to serve buyers and sellers in any market. An active and involved Central Georgia citizen, he has been recognized for his service to the community and church, as well as his success in business with many awards. As a registered foreclosure listing and sales agent with the biggest names in the Real Estate Owned by the bank (REO) business including HUD, Ocwen, Chase, Bank One, Countrywide and Keystone Management, Blair has all the connections you need to get the best deal on foreclosures. Call today for current lists of HUD and bank-owned properties. What’s your bottom line? We’ll make it happen! Education: Transylvania University, Lexington, KY Bachelors Degree Macon State College, Macon, GA Real Estate Degree Awards: Life Member Million Dollar Club, Central Georgia Board of Realtors, 2007 Million Dollar Producer, Central Georgia Board of Realtors, 2005, 2006, 2007 Top Producer, EXIT Realty Top Listing Agent, EXIT Realty Top Sales Agent, EXIT Realty Recipient of the Allen Sells Governors Award from the Georgia Realtor Institute Board of Governors, 2004 Hobbies & Personal Interests: Certified Fitness Instructor and Personal Trainer, ACE & AFAA Certified. Here’s your annual checklist of things to do to get your home ready for the change of season. 1. Don’t neglect that smoke detector any longer! Take some time right now to check the operation of detectors, and to change the batteries. If you have an older house with a limited number of smoke detectors, install additional ones at each sleeping room, and make sure there is one centrally located on each level of the home as well. 2. As houses get closed up for winter, the chances of carbon-monoxide poisoning from malfunctioning gas appliances increases substantially. If you have a furnace, fireplace, water heater or other appliance that’s fueled by propane or natural gas, or if you have an attached garage, install a carbon-monoxide detector. They’re available inexpensively from many home centers and other retailers, and offer easy, plug-in installation. either by yourself or by a trained furnace technician. Check for worn belts, lubrication needs or other servicing that might be required; refer to your owner’s manual for specific suggestions, and follow any manufacturer safety instructions for shutting the power and fuel to the furnace before servicing. Check the condition of duct joints and insulation, and of course change the filter. 4. An older thermostat that’s a couple of degrees off can result in a lot of wasted energy, and so can forgetting to lower the thermostat at night. You can take care of both of those problems with an upgrade to a programmable thermostat. They are digital and typically very accurate, and they allow for easy, set-and-forget programming of temperatures for different times of the day, including energy-saving nighttime and workday setbacks. 5. Trees that are overhanging your home can be a real hazard. They can deposit debris on your roof, scrape against shingles during wind storms and, worst of all, snap off with potentially devastating results. Have a professional tree-trimming service inspect the condition of overhanging tree limbs, and safely cut them back as needed. 6. Clear the gutters of leaf and pine-needle debris, and check that the opening between the gutter and the downspout is unobstructed. Look for loose joints or other structural problems with the system, and repair them as needed using pop rivets. Use a gutter sealant to seal any connections where leaks may be occurring. 7. A few hours and a few tubes of caulking can make a big difference in both your heating bills and your comfort levels this winter. Caulk around windows, doors, pipes, exterior electrical outlets, and any other exterior penetrations where cold air might enter. Use a good grade of acrylic latex caulk, either in a paintable white or, if you don’t want to paint, use clear. 8. In colder areas, now is the time to be thinking about having your sprinkler and irrigation systems blown out. You can rent a compressor and do this yourself, or contact a landscape or irrigation-system installer and have them handle this for you. This is also the time to shut off outdoor faucets and install freeze-proof faucet covers. 9. Fall is a great time to look at the grade around your home, and make sure that everything slopes away from your foundation to avoid costly problems with groundwater. Add, remove or adjust soil grades as necessary for good drainage. 10. If you have exterior lights controlled by timers, including low-voltage ones, check the timer settings. Change the “on” times to an earlier hour to reflect the winter darkness.